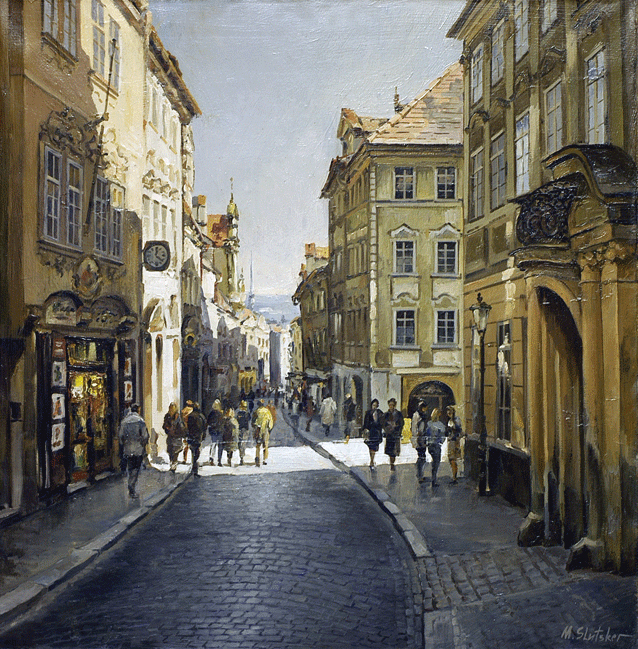 "Prague Street Scene" Oil on canvas, 27 3/4" X 27 3/4"
Michael Slutsker was born in 1946 in Leningrad. In 1970 he graduated from the Academy of Art and Graphics in Leningrad. He eventually exhibited in more than twenty International exhibitions throughout Europe. Mr. Slutzker is a member of the Society of Artists of Isreal. He currently resides in Prague where he operates his art gallery. His art is in private collections throughout the world. As can be seen in this wonderful piece he is emensely talented. His work employs the impressionistic style and evokes a sense of nestalgia that captures the essence of the scene depicted.